Close on the heels of Holi another festival is celebrated in India, the New Year festival or Ugadi. It is believed that Lord Brahma started creation on this day - the Ugadi day. It heralds the beginning of the new year, new month and new day. It also marks a beginning of new life with plants acquiring new life, shoots and leaves. 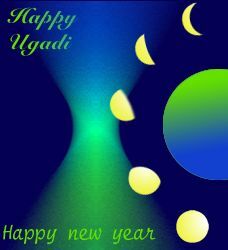 Ugadi marks the beginning of a new Hindu lunar calendar with a change in the moon's orbit.This festival is celebrated with fervour in Maharashtra, Karnataka and Andhra Pradesh. Known as Ugadi in A. P. and Karnataka, it is known as Gudipadava in Maharashtra.People prepare for the occasion by spring-cleaning their houses and buying new clothes and other items. Houses are decorated with fresh mango leaves. Large garlands of jasmine are offered to Gods in homes and temples. There are also typical dishes associated with Ugadi. In Andhra Pradesh, eatables such as "pulihora", "bobbatlu" and preparations made with raw mango are prepared. In Karnataka too, similar preparations are made but called "puliogure" and "holige". The Maharashtrians make "puran poli" or sweet rotis. 'Ugadi pachcahdi' is also a specialdish made of jaggery, raw mango pieces and neem flowers and new tamarind which truly reflects life - a combination of sweet, sour and bitter tastes! People in Andhra Pradesh make good use of mangoes to last them until the next season. They pickle the mangoes with salt, powdered mustard and powdered dry red chilli and a lot of oil to float over the mangoes. This preparation is called "avakai" and lasts for a whole year.